Lily (or Tim, as Dad insists on calling her) wants desperately to start taking hormone blockers before it’s too late and puberty sets in. Her sister, mother, and best friend Dare accept that she is a girl. But her father is afraid that she’ll be subject to harassment (or worse) at school if she comes out. And there is some justification for that fear. Dunkin is new in town. Big and tall, he’s still not used to his size or the way people treat him. When some bullies recruit him for the basketball team, he appreciates being accepted into their group. But he is torn between wanting to belong and not joining in their petty cruelty to others. Most of all, he is afraid that they will find out about his mental illness. 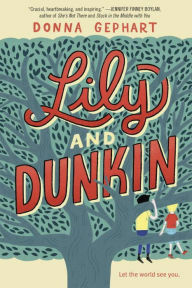 Lily and Dunkin is a fairly busy middle reader that tackles not only transgender and mental illness issues, but also conservation. It means well, but the field of books about transgendered pre-adolescents has become crowded. While this is not a bad story, it doesn’t add much to the Canon. It also suffers from being repetitive. In contrast, the part of the novel dealing with Dunkin’s mental illness seemed fresh and insightful (and much more heartfelt). As Gephart explains in the afterward, she has some skin in that game and it shows. I would have put the focus on Dunkin rather than bringing in Lily’s story in the first place.